Born to a land his great-grandparents settled in the 1870s, Ken McClintock is bound by blood and affection to Council Grove, Kansas. Shaped by the town’s history, perhaps even obsessed by it, he and his wife Shirley have reshaped a piece of that history into a treasure for us all. The story of their accomplishment begins long before McClintock’s birth — long even before the births of his parents and grandparents — and stretches back to the time when Abraham and Mary Rowlinson, immigrants from England, built a home in Council Grove. They began construction in 1860, when Kansas still was a territory. By the time Kansas had been admitted to the Union in 1861, the house was complete. Seen from the road, its native limestone walls were sturdy and attractive. Inside, light filtered through windows dressed as beautifully as any in Kansas City. In certain seasons, the walnut staircases and trim were warmed by the setting sun, and entire rooms became infused with the same shimmering, golden light that colored the surrounding prairie. As late as 1863, the Rowlinsons watched and waved from their front steps as caravans traveling between Council Grove and Santa Fe passed their home. They bid farewell to those confronting the dangers of the western journey, and greeted soldiers, teamsters, and freighters as they returned to civilization. 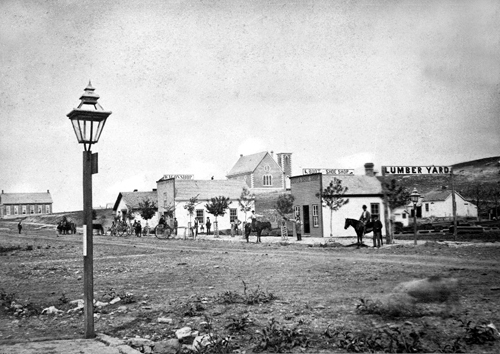 For years, the town served as the only trading post between Independence and Santa Fe. When Tom Hill built his store in 1857, it lived up to its name. The “Last Chance Store” was, in fact, the last chance for necessities like whiskey and bacon for people undertaking the travails of the Trail. Eventually, the coming of the railroad ended the importance of Council Grove as a trailhead. Wagon trains that previously had formed at Council Grove began gathering at Junction City before moving westward over the Smoky Hill route. Hall and Porter Stage Company, which had grown to provide weekly service along the trail, also moved its operation from Council Grove to Junction City. By 1872, the railroad had been completed to the Colorado border, and the primacy of the Santa Fe Trail as a transportation route was over. During this time of transition, the Rowlinson house was purchased by William Riley Terwilliger. His family arrived in Morris County in 1859, and Terwilliger soon became a successful farmer, stockman, and livery owner. When the Morris County Rangers were formed in 1863 as a defense against the bushwackers who were roaming Kansas, their Third Lieutenant was W.R. Terwilliger, and he later served on the Board of Directors of the Council Grove Savings Bank. After purchasing the house in 1870, Terwilliger added a wing in 1873, and continued to live there with his family for two decades. Eventually, ownership passed from the Terwilligers, and the house began to change. It was modified in 1907, then converted to a gas station in 1927. By the time fifty more years had passed, multiple additions and renovations had nearly swallowed the old house. While the house slowly disappeared, weighed down by the accretions of time, Ken McClintock left Council Grove to pursue a law degree. After serving in the Army’s Judge Advocate General Corps from 1968-1972, he returned home to establish himself as an attorney. The McClintocks married and went on about their lives until 1994, when they discovered that the old Terwilliger property — hardly a house any longer — was facing demolition. At the time, the building was believed to have been built in 1968. But after Ken discovered an old court document dating the building to 1860, their life took a turn. At first, they tried to recruit someone in Council Grove to save it. When those efforts to purchase and preserve the property were unsuccessful, Shirley created the non-profit Historic Preservation Corporation and purchased the property herself, operating with remarkable determination. In 2007, she reflected on the experience with Belle Grimsley for the Flint Hills Oral History Project. “The Terwilliger home was in danger of being bull-dozed. There were going to be more trailer houses moved in here and it was going to be another kind of business that would not have been historic. So, without any backing or support from anybody except the good Lord, I took on to save this property. It was in terrible condition, very dilapidated, trash all over, weeds growing everywhere. A pretty sorry sort, and everybody thought I was crazy to do this, but I just stepped out in faith. It was either do it or watch it go down. Still, as dust flew and chips of concrete piled up, it became clear that the project would be completed. Each payment, each deadline was met. From Shirley’s point of view, more than a few miracles were allowed to sustain them. A local woman left her estate to the project. A foundation provided an unexpected grant just in time to pay property taxes. Smaller, individual contributions of time, money and historical knowledge kept the project afloat. Today, the Terwilliger Home has been restored to its former splendor. The woodwork gleams, period furniture delights the eye, and everywhere you look there are historic photographs and interpretive pamphlets that help to tell the story of the home and its place in Council Grove history. In November 2001, the Historic Preservation Corporation opened the Trail Days Bakery & Café inside the building to provide revenue for its operation. In 2006, Ken retired from his law practice so that he and Shirley could operate the café, which specializes in such treats as roast buffalo and elk, as well as dishes reflecting the heritage of early Kansas settlers. The first time I dined at the Café, it was a rainy Wednesday night in October, a perfect setting for conversation with the owners. Outgoing and overflowing with tales, Ken seemed to be on speaking terms with every town resident since 1854. One of his favorites is Seth Hays, great-grandson of Daniel Boone and one of the first settlers in Council Grove. Seth’s Hays House still is in business, the oldest continuously-operating restaurant west of the Mississippi. Ken often plays Seth in historical re-enactments, although, as we talked, I considered the possibility that he might be channeling Seth right before my eyes. In contrast to Ken’s ebullience, Shirley seemed diffident, perhaps even uninterested. Silent, apparently willing to fade into the background, she busied herself removing dishes and cleaning tables until the last large group of diners left the restaurant. Then, stopping by the table with coffee, she paused, smiled, and accepted an invitation to talk. Hands tucked behind the surplice of her apron, she leaned against the edge of a table and spoke not of what she knew, but of what she suspected, what she imagined — what she felt moving through the house as it stirred back into life. She spoke of the bushwackers, the massacres, the gambling in the cellars and competitions in the shops. She mused over “Bloody Bill” Anderson, unfortunate in his raising, cursed by circumstance, and given in the end to a life of vengeful, mindless violence. She spoke of the Terwilliger family — its births and deaths, miscarriages and stillborn – and she recalled stories of the infant falling from the stairs. Accident or murder? No one really knows, but now and then she hears a frail, haunting cry carry into the silence of the house — a silence absent of all grief. And then there are the Kanza. “His name was George Alexander. He was living with the Rawlinsons. He was 45 years old, and we do not know what the relationship was, but he was a gardener. This was his occupation in England, where he came from. We think that he did something to save the lives of the Kanza during the drought of 1860. That was a horrible time here, for all of the people trying to work land, or raise cattle, or whatever they were trying to do. Because, in that day and time, there were not stores to buy goods from. You had to grow it yourself. That year, there were [no crops] grown. There was no food at all. If the Sunday School classes or the relief groups from back east had not sent food out here, many of them would have starved to death. The Kanza were already starving. So, they would come to the back doors of the settlers and beg for food. They had none to give them. So, we are thinking that this George Alexander did something to help them. After he died during the Civil War, of disease, we think the Kanza came here, to this house. It would have been the Rawlinson’s house at that time. The back door had a two inch thick solid walnut lining, which would have been on the outside part of the door. There, they cut into it a memorial to George Alexander. We think he saved their lives, somehow, through his agricultural skills. This is not based on any information we have as far as eye witnesses or written accounts. It’s our educated guess from information we’ve collected and pieced together like a puzzle. The pictograph shows the Pleiades and Milky Way as they would have been at time of George Alexander’s death on November 4, 1862. Seven points on the left side of a thunderbolt depict the seven bends of the river of life. A diamond (the upper world) contains a stick figure (the soul) and a symbol for the breath of life, the four winds, and the snare, or body, which contained the spirit until death. According to the McClintocks, the Kanza placed their symbols on the right side as one exits a door, and this pictograph is on the right. This statement is so true. We have lost numerous historic buildings in Panama since the construction boom invaded the country. Our younger generation will never see the Miller House, or the Tívoli Hotel, or the Fiscal Pier, for example. All have been wiped out. We have written several letters to authorities regarding these demolitions, but nothing comes back. Instead huge towers are emerging where once stood impressive historic buildings. I tip my hat to Ken & Shirley McClintocks for preserving the old Terwillinger Home. Thank you for sharing part of the history of Kansas. Better than going to school. I thought of those posts you’ve written about your disappearing past when I wrote this, Omar. Not everything can be saved, and probably not everything should be saved. But truly historic buildings need to be saved, even if they’re repurposed in some way. One of the great pleasures of eating at the Trail Days Cafe is the McClintocks themselves. They’re so steeped in the history of the area, they could talk forever. My first evening there, I can’t even count the number of stories they told – many of them about names, places and events I’d never heard of before. The Santa Fe Trail was important, but Kansas played quite a role in the Civil War, too, and Ken’s got just as many stories about the prairie, the fires, and the trials and tribulations of the settlers. One thing’s for sure. Memorizing dates and names is one approach to history, but it’s not the only — or perhaps even the best — approach. A good story can whet the appetite for more, and when there’s a chance to hear a story from a person who lived it – well, there’s nothing better. I am so glad you wrote this up. I only had a pale memory of that dining room and I am so happy to see a photo of Ken and Shirley. He’s quite a startling presence in that room. So authentic! And the history of the hard work they undertook explains that incredible handshake of his! What hands! And I had forgotten that pictograph. I look forward to returning in softer, prettier weather and to visit my ancestral burial grounds. Thank you for this. I’ve been fussing over this one since my first trip to Council Grove, Martha. Some of the resources I found initially “disappeared” from the web, and I had to use old-fashioned means to track down the information again. Telephones. Newspaper archives. Microfiche?!? You won’t believe Maple Camp when you go back. They have the old school there now, of course, and several other buildings that have been brought in from the country, including a historic log cabin that’s sheltering in a barn, to help preserve it. I’m looking forward to another trip, myself. It’s really quite amazing that such small towns in the middle of Kansas (or Nebraska, or North Dakota, or…) can be so rich, historically. Council Grove certainly is. And if you’ve not done so, you have to go to the Hays House and have Beulah’s Ham. I kept hearing it was the best in the world, and now I swear it is. It was so good I even shelled out a dollar to buy a laminated copy of the recipe. Thanks for the update! I didn’t spend much time there before. Now I will. I don’t eat pigs, but I wouldn’t mind the roast bison at Terwilligers again! This has the sound and feel and look of many similar stories in publications by the National Trust for Historic Preservation, which has me wondering if the McClintocks approached NTHP and/or whether that had any bearing on the decision to establish their own non-profit. No, this was a home-grown effort, begun at the grassiest of roots by a couple who love their place in flyover country. He was born into it, she married into it, and all of the credit for the beginnings of this belongs to them. Initially, he didn’t really think it was possible to save the house, let alone restore it as beautifully as they have. His initial involvement was drawing up the papers for the Historic Preservation Corporation, and telling her to go see what she could do. Well, we see how that worked out! Both of them spent a lot of time traveling the area, speaking to groups and educating them about what they had right in their midst. In that sense, the parallels between this project and the saving of the Nash Prairie have a lot in common. Susan and Peter Conaty, in West Columbia, played the same sort of role as the McClintocks. Eventually, the Nature Conservancy and others became involved – but that’s not where it started. As time went on, I know the McClintocks began receiving contributions from this organization and that, and some grants came along. At this point, there’s no telling who’s gotten involved. But at its heart, this is a tale of what a couple of mostly unknown but utterly determined individuals can do. It’s wonderful. Just out of curiosity, I went to the pages detailing Kansas State Historical Sites and Historical Markers. The single state historical marker in Council Grove can be seen here . Scroll down to Morris County. And the only state historical site in the city is the Kaw Mission. What other publicity the Terwilliger House has gotten from government seems to have come from Council Grove itself. They’ve produced some nice, self-guided tours and so on. Here’s a cool p.s. for you — Ken McClintock’s father had a Texaco gas station in the Terwilliger house for a time. I just found that tidbit tonight. That’s another detail that helps to explain the level of commitment, perhaps. What a great story. Thanks for passing it on. Our propensity to tear down historical buildings, and rewrite and/or forget history speak to our lost sense of community – in my estimation. It is interesting that the Native Americans, without written language, were committed to remembering an event, and commemorating it. In our part of the world they have an amazing commitment to keeping history alive, in part because the government’s forgetfulness comes at their expense. At any rate, it is good to be reminded to remember! Allen, when you gave me that link to the Head Smashed In Buffalo Jump, one of the little side jaunts I took was to an extensive online interview with a Blackfoot elder. It was primarily about the importance of story-telling as a way to maintain the integrity of the tribe’s history, and it was fascinating. One point he made was that creativity has no place in the transmission of tradition. The point is to learn the history, word for word, so that it can be passed on intact. As I understand it, that’s a characteristic of oral traditions world-wide. The Kanza language has been nearly lost, but I found several online links to schools, games, tutorials and so on. The Kaw Mission in Council Grove seems now to be deeply involved in helping to reclaim lost language, lost history, and cultural traditions which are fading away. It’s such a gift that the people who found the pictograph were people who could appreciate it. An utterly captivating story and so relevant to us, as our old broken buildings are flung in to demolition yards and landfill, with maybe only the briefest account of the lives they have held, the memories they contain. The Kanza pictograph is amazing, particularly with reference to Pleiades which is such an important reference point here, too. http://silkannthreades.wordpress.com/2013/06/15/matariki-and-my-mothers-birthday/ Wonderful read; thank you. Some associations are hard to break, Gallivanta. Each time I began to read “matariki”, I first read “mata hari,” and had to back up and make myself pay attention to your actual word. The stories behind your matariki are marvelous. I knew the stars as the seven sisters, of course, and for us, they were a constant in the sky. You and I also shared the little verse – “Star light, star bright…” As you quoted it, there isn’t a bit of difference between your version and mine, and I wished on it, too. One of those watercolor stars shines now at the Crystal Bridges Museum in Arkansas. From the Kanza to the Maori, to our own childhood wishes, to Georgia O’Keeffe. That’s a bit of history, too, don’t you think? I went on another little browse and found a delightful article about the museum on a site called Ask Aladdin! The article is written by someone whom I suspect speaks something other than English as a first language, but it’s perfectly charming. As a matter of fact, its cadences and construction remind me very much of certain characters in Durrell’s “Alexandria Quartet.” What pleasure it must have been to visit there. I am so glad you found that article. My internet link was terrible yesterday and I was having a difficult time finding articles on the museum. It sounds like a lot of work has been done on the museum since I was there in the 1990s which is great news. As for the Alexandria Quartet……well, let’s just say my poem for the day is actually one by Cavafy….so I shall get to it and dream about Alexandria again. What a fantastic story, Linda, and exceptionally well told! I can fully relate to Shirley’s feeling for the history of the place. Perhaps for some of the same reasons, I chose to renovate and expand the house in which we live today. It does not go back that far into history, but it has family ties back into the 1920’s and I couldn’t just let it go. Montucky, your decision to renovate makes perfect sense to me. Every “old home place” has its little quirks, its little bits of attached memory that never can be replicated. When I took my mother up to Iowa for burial, I stopped by to visit some former neighbors. I wasn’t sure what I’d find, in terms of our old house, but the comfort in finding it nearly unchanged was remarkable. The trees were taller, the flower beds had been extended a bit and it had a new front door. Otherwise, it was the same — right down to the color. Seeing that was one of the best parts of the trip. In a world where tradition increasingly is regarded as stodgy and old-fashioned, the continuity represented by the family home is important, and the preservation of “community homes” like courthouses is just as valuable. We have talked of Yost Road in Pearland and how drastically it has changed just in my lifetime. It’s like that line in the Zillow commercial — they’re not just houses. They’re places where lives happened. They’re places where history happened. How right you are, WOL – “They’re places where history happened.” When I think of all the places I’ve lived, I can describe most of them in general terms, but I don’t remember them fondly for the color of the paint or the flooring. I remember the events, the special nooks where I liked to read, the kitchen table where this or that conversation took place. What’s most fascinating about the McClintocks’ project is the way in which they’ve been able to use it to educate their own community about the importance of the place. From what little I’ve been able to gather from conversations I had and information I’ve found online, the project wasn’t without controversy. But that only means real people were involved. At this point, all seems to be well. It’s worth noting that beginning the Trail Days Café was a bit of a gamble, too. The Hays House, with its own history, is quite a draw, and a destination for people from across the state and even farther afield. I felt as though I needed to eat at the Hays House at least once, and I enjoyed it. But from now on, I’ll give my dollars to the Trail Days. Thanks, nia. It is a good story, and I’m glad you enjoyed it. Those Indian carvings on the door casing are quite a find, especially because they’re in an implement of white culture rather than of the Indians’ own. I wonder how many other cross-cultural artifacts like that have been lost, as this one almost was. I’m assuming that Kanza, Konza, and Kansas are all just different transcriptions of the same Indian word. The few online sources I found seem to support that, but I didn’t come across anything scholarly to confirm it. Steve, as I understand it, Kaw is a shortened form of the formal name for the people. And, that formal name can be spelled Kanza, Kansa, or Konza. My sense of things is that Kanza or Kansa would be preferred, and that Konza is a newer spelling. When I visited the Konza Prairie Biological Station, my guide mentioned that the original name was to have been “Kansa Prairie.” After discussion, it was feared that people would assume “Kansas” had been misspelled, and that they would go on to add the presumably missing “s”. So, they decided to go with Konza. My suspicion is that many of the law firms, water softener companies, and gift shops that now bear the name “Konza” may have adopted that spelling after the establishment of the Konza Prairie. But that’s only a hunch. I agree with what you said to Omar. Not everything can, or should, be saved. Certain places have strong and interesting links connecting our past and present times. We live our lives to make sense of what happens to us. We want to feel a part of it and feel meaningful. Stories like this one help us know that. There are many stories very much like this around the world. It is through the digging and writing by people such as you that they get told. We are all a little better for reading them. Thanks. I’m smiling, Jim, because there always is a fight going on in Houston between those who consider themselves historical preservationists and those who have a bent toward commercial development. Even after an entire city agrees on the premise that not everything needs to be saved, figuring out what needs to stay and what needs to go is quite a trick. As a matter of fact, the best example of that in Houston is the (in)famous Astrodome. Suffice it to say that the so-called Eighth Wonder of the World houses primarily rats and feral cats at this point, and no one gets to visit without guides, guards, and masks to filter out the filth.I’m assuming a decision will be made about its disposition before the city hosts its next Superbowl. You’re exactly right about the hidden stories that exist all around us. People are infinitely interesting, and you never can predict what someone might have gotten up to while your back is turned! What a neat bit of history, like taking a peek through a window in time. The perseverance of the McClintocks is an amazing gift in itself. I’m with you, Homestead Ramblings. I think the biggest miracle of all might be that Ken and Shirley didn’t just throw in the towel. But they had a vision, and they weren’t about to give it up. I thought the tie-in with your town was especially interesting. When I first heard the story about “Bloody Bill” Anderson, I didn’t know about his relationship to Quantrille’s Raiders, or that he had been in your town. He was a terrible person, no question — but his life was marked with its own tragedies, many related to the back-and-forth of the war along the border. Bushwackers, Jayhawkers and Bloody Kansas – quite a history to explore! Linda, what a lovely homage to the place and the people. You honored the heroic efforts of one dedicated and resilient person to make a dream happen. Inspiring. Now Shirley’s spirit is irrevocably woven into the house. But we mustn’t forget Ken! He had his own part to play, although it is true that he’s more identified with Seth Hays, and Shirley is more immediately associated with the house. But they worked as a team, and still do. One of the resources I worked from is a transcript of an extensive interview with the two of them. In it, Ken tells many, many stories about growing up in the area — some passed on to him, some which he experienced. I had completely missed the fact that Ken’s father had a Texaco gas station in the Terwilliger House for a time, before going into the farm implement business. So there’s that personal connection, too, which surely helps to explain his willingness to plunge into the project. An inspiring tale. Very well-written. Thanks, Dani. I love hearing and telling stories of people who do interesting things, and this is one of the most interesting I’ve come across! Wellsiree, you meet some of the coolest folks! Quick and dead! What a magnificent thing they have done. I feel a smidgen of what she feels, having saved the old cypress house now called Camp Dularge. Truth be told, I would love to restore an old historical building like that one. it’s just so very, very interesting! Another great find on your trip to the Santa Fe Trail! Thanks for sharing with us! Ah, the dead! They’re sometimes the most interesting of all! You know, BW, it hasn’t occurred to me until right this minute that one of the things I love about my work is bringing back an old boat to pristine beauty. I don’t take on as many of those projects these days, because I’m not so inclined to the truly hard physical labor of stripping, repairing, prep-sanding. But there’s nothing like the expeience of seeing something go from ugly to beautiful under your hand. I suspect that Ken and Shirley experienced that at some point. Once the beauty begins to emerge, it’s its own reward. I know you experienced that with the camp – probably with your house, too. Yes, it’s tedious and hard — but some people look at such projects and see only the sweat, tedium and frustration. There’s so much more. Glad you enjoyed this little tale. There are a few more from Kansas still to be told. Linda, this is another fascinating glimpse into our country’s past and its people. I’d never heard of the Kanza before, yet it makes perfect sense for them to erect such a “monument” to someone who saved their lives. How wonderful that, when something precious is threatened, just the right people step up to save it! Looks like they did a beautiful job in their restoration, too. Debbie, you might think you’ve not heard of the Kanza, but you know the state that took its name from them: Kansas! And so many names I knew from visiting relatives there as a child are also tribal names: Shawnee Mission, Wyandotte County, the Osage orange, Ottawa University. The naturalist John Muir once said, “When we try to pick out anything by itself, we find it hitched to everything else in the Universe.” That’s as true for history as for the flora and fauna that surround us. I’m beginning to understand why some very large history books deal with such short periods of time, or particular events. Life gets complicated, one thing leads to another and it isn’t long before you have to set some limits! When I think of the number of ways this one house is connected to so many people, so many events, it’s just breath-taking. But these are the stories that need telling. A “haunting tale” indeed! I was fascinated by the Kanza pictographs. What a fine discovery. Wasn’t it interesting to meet Ken and Shirley? I loved the fact that she quietly continued her work until it was done, and then straightened her apron and gave forth all that good history? This was such a good story Linda. Thank you. Kayti, it was interesting to meet the McClintocks. I would have missed the experience, but in the way of small towns, my host at the bed and breakfast said, “You certainly could find a good meal at the Hays House. But if you’re interested in a smaller, more unique approach to the history of the area…” And off I went. Now, I’ve been there three times, and have talked with so many people involved with gathering and interpreting the history of the area. It’s only been a taste, but I’ve learned a good bit myself about how to approach people, how to ask questions, how to communicate interest without being intrusive. It’s terrific fun. It’s also quite interesting to be around people who know the history of a place and its people so deeply it truly is a second nature. Some historical re-enactors are very good actors. They play their role quite convincingly. Others, like the McClintocks, immerse themselves so deeply into the history that surrounds them it’s sometimes difficult to remember you’re in a modern restaurant, and not in a pioneer home. It’s quite an experience. I’m so glad you enjoyed the story! Yesterday I loaded your post while briefly online, and I read it last night in the unhurried comfort of my house… wow.. what a great story, and told with your gift of transporting us to the scene! I loved every word and am so proud that the home was lovingly preserved/restored and has countless guardians watching over it for – EVER. thank you for the side trip to kansas! Z, the story is so rich, with so many details, that I keep thinking of new aspects of it to be amazed by. One is the amount of research that was required. Think of the time spent pouring over correspondence, looking at photos, reading historical accounts of the original construction, and so on. It’s not just the paint chipping that counts in a true restoration. It’s knowing what the final product should look like. There’s a classic wooden boat (and car) show here this weekend. The same issue can arise. Sometimes, people want their boat restored, and sometimes they just want it to look nice. There’s quite a cost differential! And of course, the same dynamic applies in quite different arenas of life. Let us imagine a beach, for example. Once it’s gone — whatever the reason – it’s gone. Likewise: forests. Species. Mangroves. Sometimes, restoring a house is far easier. I hope all your people are safe and well in Mississippi. I’m worried about Lynda, of Life on the Farmlet, too. They live in Hazel Green, Alabama, which took a direct hit from yesterday’s tornadoes. Spring’s here, with a vengeance. the same applies to any correspondence with you; it’s full of delicate layers that tangent in many thought-provoking directions.. where do i start? my inbox wasn’t filled with many emails from ‘home,’ so i am sure that all’s well there and in little rock where family lives as well. thanks for the heads up on lynda, and thanks to you i’ll be sending her strong energy w/hopes that all’s ok in her world and her loved ones. that particular house had only canya siding, so the lygus bugs, etc are a true threat to the families that live there.. hmm, bats as well. in ntz mississippi, i worked on one historic restoration and loved peeling layer of layer of wallpaper from the walls til we reached the original plaster (beautiful!) i loved learning how to replaster and made the semi-authentic repairs… where we found signatures on the walls from the original work, we left those exposed – i had a battle of the wlls w/my former husband on that one, though when people commented on the signatures (later) he softened and accepted it. people often stopped and thanked me when i was working n the yard, as the house had been neglected for quite some time.. but nothing like that grand rich-in-history home in kansas! when i saw that fuel station ‘tacked’ to the side, i groaned and physically felt the sadness that the property surely felt… and to see it restored – yes, every grain of sand/rock/soil surely smiled after being neglected for so long. well i’m painting a floor and shoujld get back to my work! middle of the day is my personal deadline, and the varniz para pisos will begin! Thanks, becca. It is intriguing. Every time I think back to my visit there, I have more questions, more pathways to explore. I’m glad you found it interesting. Susan, I’ve come to think of history as a combination of a jigsaw puzzle, a 1930s pulp magazine, and my mother’s cedar chest. I loved all three as a child, but I especially loved digging around in the cedar chest. No matter how many times I dove in, I always found something new, making the experience rather akin to poking into those corners of history you mention. As for spirits drifting around, my first experiences of such a thing came up in the Texas hill country. My beloved retreat had an Indian mound near the springs. Presumably, it was a cooking mound. I used to like to go down there and search for arrowheads, scrapers or flint chips after a hard rain, when another layer of soil sometime washed away and revealed them. Let’s just say there were times when I clearly wasn’t alone, and I knew it. Susan, take a look at this! It’s another Terwilliger house, right in your backyard. Here’s a very interesting article about the use of tree rings to date the place. Now I wonder about any possible relationship between the two families, but I’m going to be very, very firm with myself and put that on the back burner for now. Wow, great spotting on your part! I have been to Locust Grove itself several times–beautiful grounds and walking trails, including views of the Hudson. I’ve only had a chance to glance at this as yet (I’ve bookmarked it to read over the weekend), but it appears that, while Locust Grove manages the Terwilliger House, it’s located somewhere else in the general area. I have seen some of the Huguenot homes in New Paltz, and it may well have been the Terwilliger was included in the group. But it’s been a while, and I’ll have to get my better half to recall for me. Anyway, great find, and thanks! I was just sure you would have been to the area. I’m so pleased that’s so. And you’re right about New Paltz. Happy exploring! My hands ache when I think of the cement those two blessed souls chipped off that old house. To those of us who have never participated in total restoration like this hearty prairie pair, whose inventiveness and pluck rival Willa Cather’s greatest heroes, we can take away a sweet narrative, one that you have delightfully told on your blog. Context is everything, as they say. Chipping concrete off limestone, as a task, isn’t so far removed from the “breaking rocks in the hot sun” once a staple of chain gang life. The difference, of course, is that the McClintocks could choose to work in the shade, or take a lemonade break when necessary. It’s such a pleasure to tell stories about people like the McClintocks. And if someone searching the web for a place to eat in Council Grove should find this piece, and stop by for a buffalo burger, that’s all to the good. I only wish I could stop by myself! “Hearty prairie pair” is exactly right. And I’m so glad you enjoyed the post. Good heavenly. Linda, where do you find these stories, or do you think they perhaps happen TO you? This quote — “It’s not the house that’s haunted. It’s history that’s haunted, filled up with the spirits of everyone who’s been here before. That’s part of the reason I had to save these buildings. It’s not just for us, it’s for them.” — is the heart of all of this, which I’m sure you know. Which I’m so glad you shared. It takes a while to learn how to stare properly, especially for those of us who were raised with the admonition, “Don’t stare! It’s not polite!” But as I’ve learned, people often enjoy being stared at, especially when it’s curiosity and real interest that are doing the staring. I’m so glad you enjoyed the story. It’s well known in certain parts of Kansas, but it’s not just for the Kansans. You never cease to amaze me. Your quote from Georgia O’Keefe on your About page is one I return to: “Where I was born and where and how I have lived is unimportant. It is what I have done with where I have been that should be of interest.” Your ability to engage in just the right way to mine these stories, search and research the details, is as important as the work of all Historic Preservation efforts. You certainly have an ability to soak it all in and join the pieces for us in this wonderful essay. I will never hear the name Kansas without remembering what you have taught me here. Thank you for this inspiring read. One cannot take for granted the “splendor” of the the Terwilliger Home after you present all the evidence, the miracles, the faith, anxious moments…haunted history of it all. You bring out all the senses — the taste of bison and the smell of good food, the storytelling, the touch of a firm gripping handshake, the delightful image of this home restored and more over and over. Random thought: You made me think briefly of Isabel Allende’s House of Spirits and G.G. Márquez’s magical realism as American. You’re right though, the web of details of each individual region is huge in itself and is to be savored for all its singularity and uniqueness. Georgette, if I’ve learned anything from writing these stories, it’s patience. After my first visit to the Trail Days Café, I could have thrown up some photos and detailed a few facts, but it took two more years and two more visits — with a good bit of research and conversation in between — to come up with this post. At least now I understand how people like William Least Heat-Moon put together something like his “Prairy Erth”. It’s less mysterious than I’d imagined it. Add a hundred thousand words and a few years to this post, and it’s “Prairy Erth”‘s cousin. Obviously, working at such things part-time makes a difference. I’d like nothing better than to have more time for travel and writing. The trick is to make that happen. I’ve already tossed the tv and I don’t hang around in bars – I guess I need to find some other way to declutter my time! But the needed skills are scalable. I can learn them with the time I have now. Isn’t that O’Keeffe quotation perfect? All of us have experiences. All of us have a history, a talent, a heritage. What we’re going to do with them is the question. As for magical realism, my first conversation with Shirley in the restaurant may have been my purest experience of such a thing. How wonderful that Shirley and Ken’s efforts were successful, and how fortunate for all who will enjoy it. I hate to see these old buildings destroyed and their history lost. Once gone, they are not coming back. It often requires a tremendous desire and commitment by a single individual to get the ball rolling. I enjoyed all the history and educated guesses that you gave us here. History benefits from a little color. At least I think so. Don’t you think that history’s pretty colorful all on its own? I do — it’s that we drain it of its color by reducing it to a kind of “just the facts, ma’am” sort of exercise. On the other hand, there’s nothing wrong with facts. We sometimes just need more of them – more original documents and fewer second (or third, or fourteenth) hand reports. The best news is that even when Ken and Shirley aren’t around any longer, the house will be there, and cared for. It’s become as much a monument ot them as to the Terwilligers. I’m on the trail of another tale now, that’s much, much closer to home. I haven’t quite figured out how you interview a ghost, but I’m working on it! Well, first of all, I want to know when the book comes out because what a story you tell — and how much more could be yet to come. You DO meet the most fascinating people — and you have the reporter’s skill of being able to allow them to reveal themselves and their stories in a way so divinely remarkable! It just kills me when historical buildings are demolished. I so admire these amazing people for all they did for their community and for the future. It just occurred to me to wonder: could it be that our willingness to tear down historical buildings and our thinly veiled contempt for the elderly are related? Getting old brings enough practical problems, without being seen as nothing more than an obstacle to be moved out of the way. But that’s another subject, for another day. Happy weekend! If you see Harry, give him my regards! The Kanza Indian etchings on that old slab of wood intrigues me. And even more astounding are the Mcclintocks who just about worked their fingers to the bone and restored that old house to its former glory. Surely they had some help here and there. I am so glad the house was saved. An outstanding feat. I think that you are most definitely a history buff and your readers/followers are all the richer for your writing talent. This was such an enjoyable read. Oh and the first photo I like the most. You captured the stained glass window perfectly. They intrigue me, too, Yvonne. Clearly, the relationships between the settlers and the Indians were more complex than some accounts would have it. “Bloody Bill” Anderson liked to ride into battle during the Civil War with Yankee scalps as decoration, while the Kanza honored an English gardener. The truth often beats fiction, hands down. Clearly, the McClintocks had help with the “heavy lifting” that had to be done, as well as with the research. But that was part of their talent, too — pulling people in, getting them interested, enlarging the circle of people dedicated to saving the old place. It’s true that I enjoy history, although that wasn’t always so. I have found that when I’m able to dig a little more deeply into a subject, I find writing even more enjoyable — I’m glad you enjoy the reading, too. The woodwork and the windows in these old houses really were beautiful.When you think about it, those were two places where they could “fancy up” their homes. Sometimes, they had to make do with plain rather than fancy. For a time, this house had a dirt floor in the kitchen. Eventually, wood floors were installed – I’m sure they were happy about that! I have the greatest respect, even reverence, for folks who save buildings like the Terwilliger house, from ruin and destruction. It makes me shudder to think of how many places like that have been lost here in New Jersey to runaway, cookie-cutter development. I have played a modest part in such efforts, but nothing to compare what the McClintocks achieved in Council Grove. Every detail of the story you told is important. Thank you. Runaway, cookie-cutter development is everywhere, it seems. Here, it’s made even worse by the fact that so much of the building is “on spec”, and the commercial developments (read: strip centers) can sit empty for months or years after being built. There’s also an important lesson here about the power of individuals. The same thing happened in our town with the saving of the Ghirardi Oak. In the beginning, it was the Ghirardi family and one extraordinarily determined City Council member who got the ball rolling. In the end, the oak was saved, just as the Terwilliger house was saved. Of course, our modest efforts count, too. It can be easy to dismiss a seemingly obsessed individual or two as crackpots. An entire group of seemingly rational citizens dedicated to a particular goal is something else. I’m really glad you enjoyed the piece. It was an especially satisfying one to write. How wonderful to have found photos depicting the building in its various guises. The McClintocks have tremendous stamina and determination. I love Shirley’s reply about haunted history. A picture truly can be worth a thousand words, can’t it? In this case, I’d say the photos are worth even more than that. I don’t know about you, nikkipolani, but when I look at that image of the house-as-gas-station, I’m just overwhelmed by the fact that Shirley wasn’t overwhelmed. There are a lot of lessons here, and not all of them have to do with the best technique for chipping concrete. My heart broke a little when I saw that photograph of the gas station. But as soon as I caught a glimpse of the restored home a few pictures down, I smiled, and started breathing again. Some things are just obviously right, and what Ken and Shirley did to save that building is one of them. Now I have to go look up the term bushwhacker. What I haven’t found and what I still want to explore a bit is the response of the town as a whole to all this. Clearly, some saw the possibilities and joined in, but if we understand the process, how that happened — well, it might make other projects a bit easier to accomplish. Today I first learned of the existence of this website, and I have been overwhelmed by the comments made by the readers of this well-worded article. It is quite encouraging to find people “out there” who truly understand the importance of the sacrifices Shirley and I have made over the past 20 years, to preserve this important piece of history. In August 2014, the National Park Service recognized the Terwilliger Home (as the Rawlinson-Terwilliger Home, to include its original builders) as a certified site on the Santa Fe National Historic Trail, the 12th such site in Council Grove, Kansas. I could make many, lengthy comments, but at this time I will mention only the reply describing a Terwilliger Home in New Paltz, NY. Yes–the builders of that house were related. The Terwilligers in 2013 celebrated 350 years in America, having come to New Paltz from the Netherlands in 1663. William Riley Terwilliger was born in New York, and we have a genealogy tracing his family back to the Netherlands. Ken, I’m delighted beyond words that you found this. I’d actually throught of sending you a link, but life being what it is, I became involved in other things and forgot to do it. I’m so pleased that another, more formal recognition has come to you and Shirley, to all the others who helped in this marvelous restoration, and to the house itself. It’s just wonderful. And I’ll be sure to pass on the information about the home in New Paltz to Susan and others who were interested. It’s great to be able to put places into a greater context. There’s no reason for you to remember this, but we had a short chat at the Trail Days when I was in Council Grove two years ago. The interview you and Shirley did with Belle Grimsley had disappeared from the internet, and I was curious whether you might have had a copy. You were unsure at the time, and I didn’t pursue it later because the interview is accessible again online. You can find it here. I’m hoping to see a prairie burn either this fall or next spring, and the tales you told of fire-fighting and fire-controlling with your dad will be a great resource there, too. You might enjoy another piece I wrote about Council Grove, called “Circles of Commerce, Circles of Life.” There are a couple of others that you can surface by entering Council Grove in the search box in the right sidebar. Again, I’m thrilled to death that you found this, and even more thrilled that the good people down at the Cottage House steered me to the Trail Days Cafe when I first came to Council Grove. The next time I’m in town, I’ll stop by to say hello. The “National Park Service recognized the Terwilliger Home (as the Rawlinson-Terwilliger Home, to include its original builders) as a certified site on the Santa Fe National Historic Trail.” That is fantastic! Congrats to the McClintocks, and thanks to you, shoreacres, for noting all of this to us. Isn’t it wonderful, Susan? I need to get the news to Martha Tenney, too. She’s a blogger who has roots in Council Grove. Her great-grandparents and assorted other family members are buried in the cemetery, there. Mr. Tenney was involved in a store in the early days of the town. We don’t have quite as lengthy a history in this country as you’ve experienced in your summer travels, but what we have is well worth cherishing. Dwight, how kind of you to stop by. I appreciate it very much. I enjoyed my conversations with both Shirley and Ken, and have completely enjoyed chronicling this great project. The next time I’m up there, I need to devote some time to the other buildings at Maple Camp. Every town has its history, of course, but Council Grove is especially rich, and captured my imagination. My best to you and your family, and many thanks for supporting Shirley and Ken. What a wonderful turn of events, Kenneth. Thanks so much for bringing it to my attention, and adding the new information here. Every now and then, I do a post filled with “updates” to stories I’ve written about, and the next time I do that, I’ll be sure and add this information. People certainly did enjoy the post, and I know they’ll be interested. My best to you — I hope all is well on the prairies. Even better! And I’m really glad you took the time to come back and add this. It’s hard in a country this large and diverse to keep up with all the wonderful things that are happening, and this certainly is another. If I’m lucky, I’ll be able to spend a bit more time in your area, and enjoy your great hospitality again. Kenneth, this is just wonderful. I’m so happy for all the developments, and delighted that you stopped by to share them. I still have an old copy of that “Kansas Byways” tour guide. It’s time to update it, and time to get back up there for another great meal at your place. I’m so limited in time and funds, but with any luck at all I’ll be back in the area in the next year. Now that you’re give me a bit of encouragement, I need to start thinking about how I’d like to focus next time. And of course there will have to be a new blog post, to match all the changes that have happened for you folks. Now, that is great. Congratulations!